All morning I have been talking to my pooch, Chickpea in an Irish accent… and I’ve learned that I’m atrociously bad at speaking in an Irish accent. Note to self: never attempt an Irish accent in the company of anyone, ever. Period. Good thing → this is a written post, so you don’t have to listen to my atrocious accent. More good things → good things are happening in my kitchen today, so many GOOD THINGS! 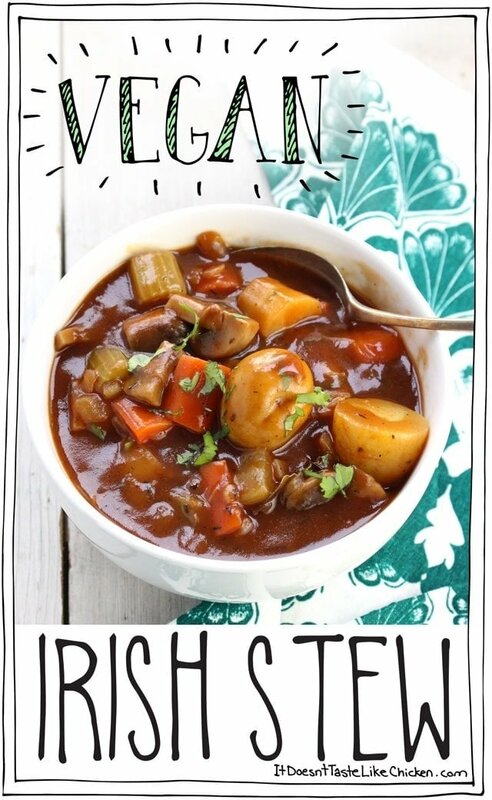 This Vegan Irish Stew is just so many good things in a bowl it will make your stomach smile. So dang hearty, it’s a stick to your ribs kinda stew. I’m pretty much obsessed with the mixture of chunky vegetables in the rich stout based broth. Eeeerrrrrrrrk! ~Record scratch~ I’m sorry, did I say stout, as in beer? Yes, yes I did. Irish stew is traditionally a lamb stew made with Guinness stout beer. Obviously, lamb isn’t vegan, and Guinness isn’t vegan… yet. Believe it or not, the people at Guinness announced they are changing their 250+ year recipe to make it vegan! Is that a sign of the times or what!? 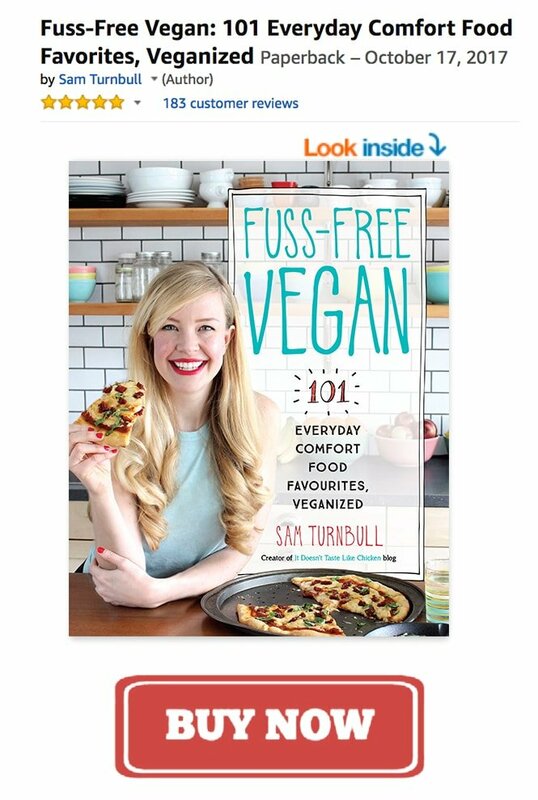 (Although, if you live in Australia, it’s already vegan down there, woot!). Back to broth. The stout beer in this recipe gives the broth the rich, thick, and deep earthy tones. The alcohol gets cooked out, and the end result doesn’t really taste like beer anymore (this is coming from someone who isn’t a big stout fan), it just tastes of awesomeness. Seriously, good things are happening in my kitchen today. As Guinness isn’t vegan yet, I took my handy-dandy Vegaholic app to the store, (you could alternatively check out Barnivore online), and found myself Sawdust City Brewing Co.’s Skinny Dipping Stout, which is totally vegan-friendly, but any vegan stout you find will do just fine. 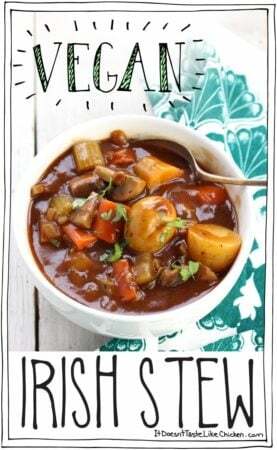 To make Vegan Irish Stew: Gather up all your hearty veggie goodness. Omnomnom. 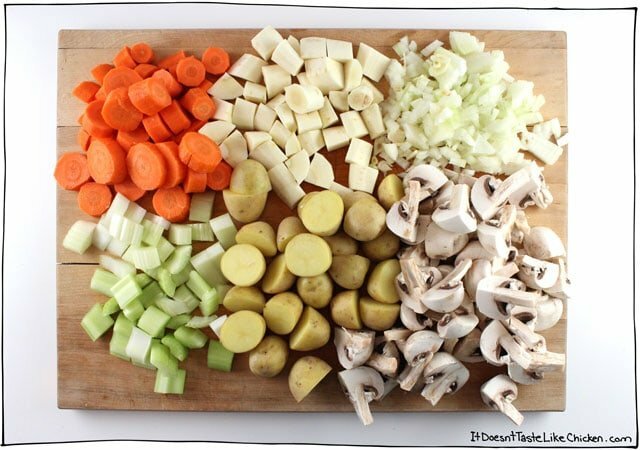 Chop up all the veggies into chunky pieces because this stew is all about rustic chunks of veggie deliciousness… and beer… but we’ll get to that shortly. Sauté the celery, onion, and garlic in the olive oil, until the onion becomes translucent and just begin to brown. Now sprinkle in the flour. Stir well to coat the veggies, and cook for another minute to heat up the flour. Add the vegetable broth, and scrape the bottom of the pan with your spoon to get any bits off the bottom. Add in all of the remaining veggies, tomato paste, spices, and the beer! (See, I told you we would get to that part). It will probably foam and do beer-like things, but that’s ok, the bubbles and alcohol will cook right out. Bring to a simmer and cook for about 10 – 15 minutes until the veggies are fork-tender, but not mushy. The stew will be very thick. 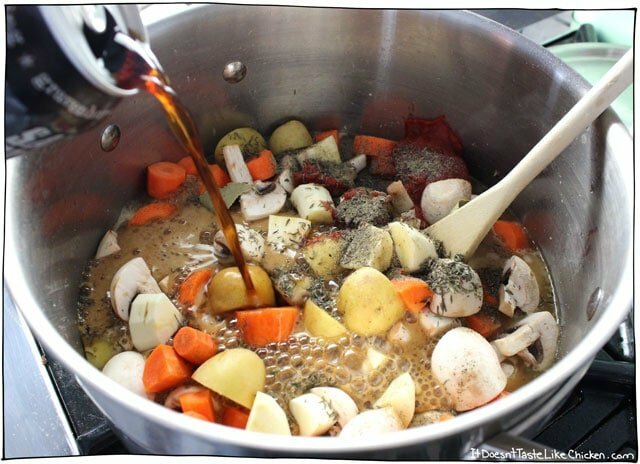 If you prefer a thinner stew, feel free to thin it out to taste with 1 to 2 more cups of vegetable broth. I made this a couple years ago and it was delicious!! My family thought it was a bit tomato-y but I loved it as is (I posted a pic of it on Pinterest). I used shiner bock as I didn’t have stout. I’d like to make it again but am wondering, does this freeze well? So happy you enjoyed it, Alaina! Yes, this recipe should freeze well, but potatoes can get a bit grainy when frozen, so if you are ok with that, go for it! Made this on Sunday and added some chickpea tofu at the end. PHENOMENAL. The sauce is perfect. Thank you! Made it for 2019 St. Patrick’s Day and we loved it! It did take longer to cook (at least to get everything the perfect tenderness), but we started early and allowed extra time for simmering. Put a lid on the pot during the simmering part and it came out perfectly — just the right amount of nicely thickened liquid (but not so thick that we had to thin it out), delicious veggies, perfectly seasoned. Used just two cups of veggie broth plus the bottle of stout. With two people prepping the veggies it’s fun and takes less time. Exactly the right meal for St. Patrick’s Day (and followed by vegan Bailey’s ice cream and vegan brownies). Thanks for another outstanding recipe, Sam! Just made this for St-Patrick’s day. I have to say it was incredibly bitter despite adding extra , and I mean EXTRA brown sugar. Also added dumplings to help calm the bitterness. I know some people have the ability to taste bitterness more than others so I am hoping that is the cause. In the past I have used a much lighter tasting beer with a bit of red wine and not had that bitter taste. I am currently using the rest of the liquid and adding more veggies and broth to see if I can make a newer less bitter tasting stew. That being said it seems the longer it sits the more bitter it gets. If this doesn’t work I will just make it with a different beer next time. Adding the dumplings is definitely a MUST! Thanks for sharing this recipe. Hi Lizzy, the bitterness comes from the stout. So I recommend trying a less bitter stout or reducing the amount next time. Also adding acidity will help cut the bitterness, so you could add a splash of apple cider vinegar or lemon juice. Hope that helps! My new go-to recipe for St. Patrick’s Day! Delicious!! Hello Sam! This recipe looks wonderful! I would like to add some vegan “beef crumbles” – do you have any suggestions on how to alter the recipe to allow for – say- one package of crumbles added into this recipe? Thanks for your help! This looks wonderful! Another awesome recipe, Sam! Thanks!! My wife and I really enjoyed it! 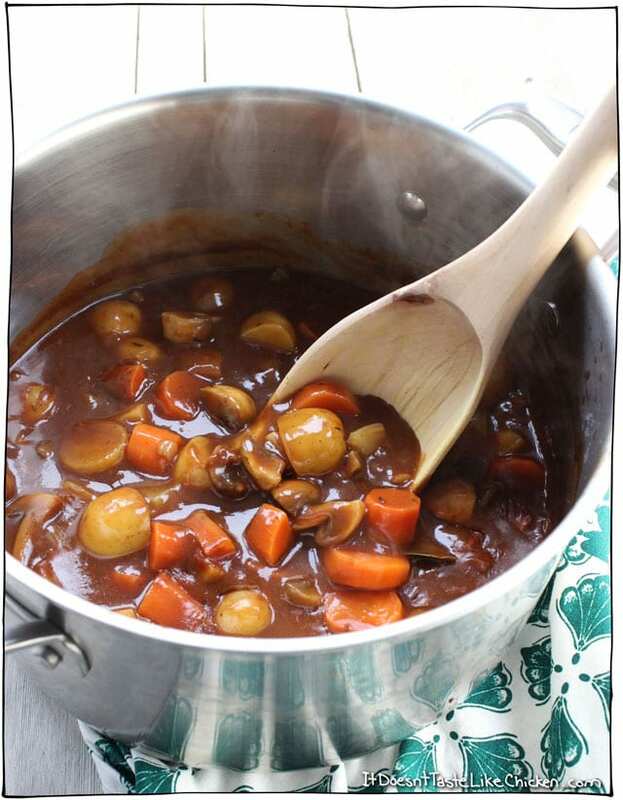 This is a delicious, savory and relatively easy to make stew. The only reason I didn’t give it 5 stars is because the prep and cooking time is completely unrealistic. A professional chef with helpers in a gourmet kitchen might be able to prep this in 10 minutes, but no normal cook in a home kitchen. And 40 minutes cooking time? Uh-uh. 10 – 15 minutes of simmering the vegetables? Come on. I couldn’t put a fork in them at all, they were still hard as raw. It took another 30 minutes before they were “fork tender”. Make this recipe, it’s wonderful. But you need to plan on at least 1 1/2 hours before that meal is on the table. And PS – if you don’t have stout beer, use red wine. So happy you enjoyed it, Elizabeth. The times are based on the times it took me to prepare the recipe. When recipe writing I use a stopwatch to note the times. Sorry, it took you longer but I am glad you enjoyed the end result! I haven’t made this yet but yeah I can tell prep for me would be 20 – 30 minutes. Also I seem to find when I add any tomatoes product to vegetables it seems to take longer for them to get tender or sometimes they never do. So I always get the veggies cooked first and then add tomatoes. No one else has mentioned it being a problem but it’s always been like that for me. Anyway the stew looks yummy and I plan on making for st patricks. If I wanted to make this gluten free would I just use gluten free flour? I’ve made this at least 8 time in the last year and I always use regular flour but recently we went gluten free. The flour used in this recipe is to help thicken the stew, so yes a gluten-free flour should work fine as long as it thickens. Enjoy! The only stout my grocery store had was in a massive multi-pack, so I decided to try it with Fat Tire first. It probably tastes different than the original recipe, but it’s delicious anyway! I’ll definitely try again with a stout. I used the extra stout. Could that be why it had a bitter taste? The potential for a great stew was there otherwise! Thick, rich, lots of flavor, but bitter. Yes, stout is the bitter flavour in this stew, so if you use more it will taste more bitter. Did you leave out the brown sugar? Leaving out the sugar in any recipe like this one will ruin it and cause bitterness or other unpleasantness.. I think she paired the sugar with the “spices” when she said to add the spices. That’s how I interpreted it at least! Made this tonight for a family of four. So good. I loved it! My picky daughter had very low expectations when I told her what we were having, but even she liked it. So simple and so flavorful. Thank you. 4 cloves of garlic is NOT enough for 6 servings of soup. I mean, hail, I figure at LEAST a half a head per dish. Haha! You’re welcome to add more or less garlic to taste. I love this stew, the flavour is amazing. I’ve tried it with lots of different stouts and the result is always lovely. The only thing I’m having trouble with is the thickness, you mention that it will be very thick and may need watering down – but mine is always too watery! I’ve tried more flour, less broth and tried mashing some of the potatoes while in the stew to thicken it but it’s always like a watery gravy, it tastes lovely but doesn’t look half as appealing as yours! Any advice? Hmmm it’s difficult to know without being in the kitchen with you. Are you using regular all-purpose flour? I recommend starting with the 2 cups of vegetable broth. Try checking out the video as well so you can watch me make it and see if you did anything differently. Enjoy! 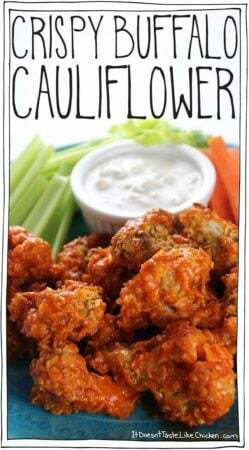 I have made this recipe twice now and my family and I absolutely love it! It’s for sure a regular meal on our list! 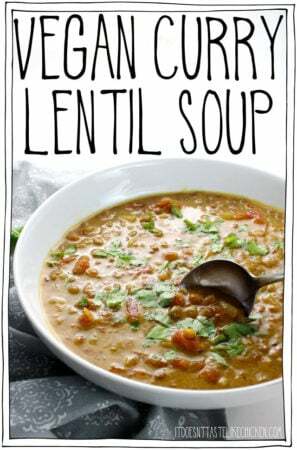 Thank you so much for sharing this, I have a lot of food sensitivities and was struggling to find dishes for the whole family but this one is delicious! The only thing I have to make sure with it, is that it is also gluten free which is easy! I follow the recipe exactly how you prepare it. If anyone hasn’t tried it your surely missing out!! My meat-loving husband surprised me and made this for dinner. It is delicious! Thanks for sharing. So. Delicious. Even my husband said so, and he’s usually weird about adapting recipes and/or vegan recipes. I used a half bottle of New Holland Oatmeal Stout (drank the other half with the meal), left out the parsnips, added barley added dried parsley. Had to use full 4 cups of vegetable broth. I also cooked the mushrooms separately so they could be added (one of my kids doesn’t like mushrooms.) Came out great – no bitterness. Mine turned out Very better. Anything I can do to fix it? The bitterness comes from the beer you choose to use, so you could try another beer or acidity cuts bitterness so you could add a squeeze of lime or splash of vinegar. Enjoy! Can you use something instead of beer? You could just use more vegetable broth. You might want to up the spices a little more to make up for the lack of flavour from the beer. Enjoy! I don’t have a crockpot so I don’t know the timing but I am sure it would work just fine. Love this! I always use Guinness, slice my mushrooms rather thin, and add a cup(ish) of frozen peas at the end. It’s the perfect dinner for a wintery night – or any time you want a bit of comfort food. Thank you so much, Sam! I do know that – and I’m not vegan so it’s not an issue for me. Just chiming in to say that this was delicious and my partner and I loved it! Thank you so much for sharing. My husband has been vegan for almost 10 years I have only been vegan for almost 2 years. My husband is Irish and we saw this recipe. I was so excited to try it. I’ve had good luck finding vegan recipes online however this one was not for us. It had a very bitter after taste. I had to adjust your times it took much longe to cook than your recipe stated ( I diced all the root vegetables my husband doesn’t like large chunks). I did use portabellas as a meatier mushroom. Great idea just not for us! I haven’t had a stew since going vegan over 2 years ago. Last week, my boyfriend said he wanted stew and I remembered that I had bookmarked this recipe a few weeks ago. I made it and it was amazing! Far better than the beef stew I used to make and I can’t wait to make it again. Great recipe! Wonderful!!! So happy you love it so much, Madison!! Hi, Where does the brown sugar go? In the list but not in instructions. In the last step along with the other spices. Enjoy! This looks great! My partner and I are a vegetarian/omnivorous couple, so finding filling, interesting dishes like this one is especially good for us. Looking forward to trying it this week! Haha! Awesome, thrilled you enjoyed it so much, Barbara. So I just made this awsome stew! The only single beer in the store was Guinness extra stout….22oz I bought it because I don’t drink beer and I didn’t want to have extra .my recipe turned out really good but because my beer had extra stout it was super strong but still very good I added dry savory seasoning and served it over cooked farro . I love farro the chewiness of it with it it’s very good . Great recipe! This is amazing!! I made it in a pretty large batch since I’m a college student and this is a delicious meal I can put in jars and take with me! Loved it!! So hearty, so warm, so yummy! My 2 year old loved it. Didn’t have parsnips so added cauliflower instead. Will definitely make again and try adding different veggies for a switch up. Hi Sam! I made this stew for the evening meal on St. Patrick’s Day. I was so surprised (although I can’t think why-all your recipes are the BOMB!). The gravy turned out to be “beef-ier” than any gravy I ever made with beef. There was something in the way the stout mixed with the veggies and broth and flour that made for a satisfying, creamy gravy. Genius! Thank you for your wonderful videos and recipes. This stew was sooo good! I added some green cabbage because that’s been traditional with corned beef and I had just run out and bout a small head before deciding on this recip, so wanted to use some. 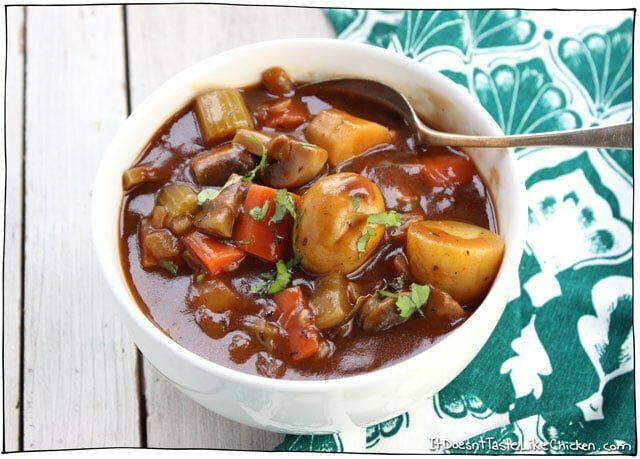 It was my first St. Patrick’s Day stew as a vegan, and it delivered! The parsnips have it a nice crunch and some sweetness. Turnips might also be a good addition I’m thinking. I think the shiitake it-I used a 12 oz bottle of Guinness. Thanks for emailing this recipe. It’s a keeper!! Arghhh, I bought a small head of cabbage before deciding on this recipe.The parsnips gave it…I thought the stout made it (not shiitake). I really have to check the autocorrect on my Kindle before sending . I used my Instant Pot (IP) to make this and replaced the nips with more potatoes and we used Guiness Stout.. I used the IP saute feature for the onion, celery and garlic (using water rather than oil) and then added all the other ingredients. I didn’t have fresh mushrooms, but I had shiitake mushrooms leftover from your Crispy & Chewy Sesame Shiitake and soaked those to use. I used the resultant broth for the called for vegetable broth. I used the IP manual feature set for 12 minutes and allowed 10-15 minutes of natural release. It was very good with Irish Brown Soda Bread. Jessica, what Irish Brown Soda Bread recipe did you use? Sounds like an ideal pairing! Wonderful, so happy you enjoyed, Jessica! Thank you for details cooking this receip in your IP. I will also make this now in my Instant Pot because of your instructions. I can’t wait to try this wonderful recipe. I think stout may be an acquired taste…I remember trying a Guiness back in my early 20s and thinking how awful it was-fast forward over 40 years and now I find it to be a rather mild, and enjoyable stout. I look forward to it each St. Patrick’s Day. The rest of the year I’m an IPA drinker. My stew’s still simmering, but it smells delish. I added some fresh cabbage because, well, what’s St. Patrick’s Day without cabbage? Hi Mary, that’s too bad! Maybe it needed a little bit more cooking to finish cooking out the alcohol? Or perhaps the stout you used wasn’t to your taste. It’s difficult to know without being in the kitchen with you. Sorry, I can’t be more help! I’m going to include veggie protein chunks to mimic ‘beef’ so that there is a protein element. Also, doing in the slow cooker. You might try soy curls or jackfruit. Wonderful! I hope you enjoy it, Jessy! This looks delicious, I’ve a mind to try it this weekend! How long does it keep for would you suggest? Hi Allison, welcome! In this recipe I mean paste the thick stuff that comes in the tiny can like this. I have lived in the US as well, and I am pretty sure we both call it the same thing. Hope that helps! I also found the 1/2 cup of tomato paste to be confusing and assumed that it was a typo. Most recipes call for a tablespoon or two only as the Italian version comes in a small tube and is double concentrated. Just to confirm… should we use a half cup of that. Yep, the recipe is correct as written. I buy my tomato paste in a can. This was really delicious! I never used stout beer before, but it came out very nice. Taste good, but the veggies need to cook far longer than the recipes instructs – about 45 minutes! Do you think this would freeze well? Thanks! Usually, potatoes don’t freeze well, they tend to get mealy once thawed. So I wouldn’t recommend it. Anything I can use to substitute the beer? Alcohol free here. Thanks! Hi J.J. You could use a non-alcoholic beer. I was just wondering if I can use cherry stout? Or will that effect the taste of the stew too much? I wouldn’t recommend it, the cherry flavour would be odd in stew. This was absolutely delicious! I thought that the tomato paste was going to be overpowering, but it turned out perfectly. My husband, (sometimes) picky toddler and I loved it with fresh bread to mop up the sauce! Can’t wait to try out some of your other recipes! Our appartement smells SOOOO good. I bet the neighbors are saliving just walking pass our door Thanks for the recipe! Sam, once again you have out done yourself. This is an amazing dish!!!! My whole family (even the teens) love, love, love this stew. I’m sure it will be a “Old standby” from now on. Oh and btw the smell throughout the house as it cooks is also amazing. 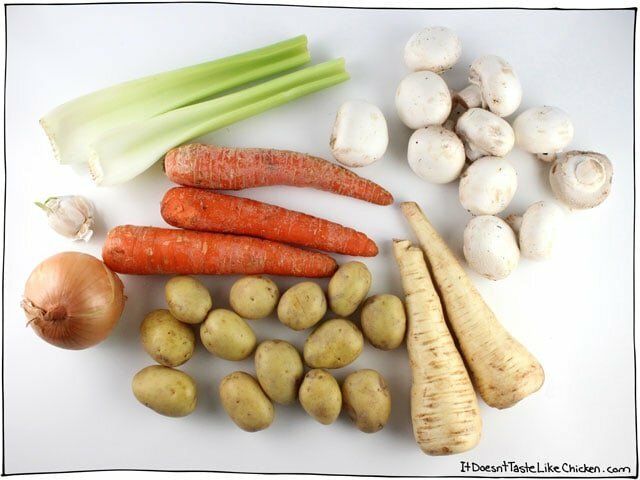 I am so excited to make this stew! However, I am concerned with amount of stout your recipe calls for. It looks like 1 can (473ml) of stout but that it could also be 1,473ml can, as in a whole 6 pack, of stout. Help please! :) I’m sure its the first but that comma is confusing me haha! Thank you, I thought the same thing. Can’t wait to try tonight. I see why Eve was confused. The recipe reads: 1, 473 ml can vegan stout beer. It shows a comma after the 1 making it look like 1,000 instead of 1 (437ml or 16oz.) can. Could you put this in a crockpot? If so, how long would you suggest and on what temperature. Hi Christine, I’m sure you could, but I don’t have a crockpot and I’ve never cooked with one so it’s not my expertise I’m afraid! Is there a way I could substitute something for tomato paste? I have a slight allergy to tomatoes. It’s a little hard finding recipes that are vegan without tomato products. Tomato paste adds depth and richness, but if you are allergic then you might just want to skip it. You may need to bump up some of the other flavours according to taste. Hope that helps! Thank you! I did find that you could use tamarind paste in place of tomato paste. I’ve tried it in one other recipe today and i couldn’t tell the difference. Ah! That’s a great idea! Do you think replacing the brown sugar with molasses would be acceptable? This recipe looks delicious! Thanks! I think that would work just fine. Enjoy! Just made this!its absolutely delicious!! this recipe is amazing! used a bit less stout and a little more broth…. didnt put in parsnips just added more potato. ALSO didnt use tomato paste used blended whole tomatos and it was STILL incredible. YES! You’re most welcome, Samantha, so happy you enjoyed it! (Great name by the way 😉 ). Hi Nellie, check out this definition on Wikipedia. You mentioned you can replace the beer with mushroom broth. Would the amount be the same? I don’t like even the slightest taste of beer, so I didn’t know if the recipe would change much if it was omitted. The amount would be the same. Enjoy! This…. was…. PHENOMENAL!!!! I made it exactly as written except I subbed Brussel sprouts for the parsnips, and since my husband was late getting home, it ended up simmering for almost an hour and a half. We couldn’t stop eating it. At my husband’s request, I’ll be making this again and again! Thank you for sharing! Woohoo! Thrilled you and your husband loved it so much, Karma 🙂 Thanks for the lovely comment! Yay! So happy you enjoyed it, Carina! Hi Jenny, I don’t have a crockpot so I am not 100% sure, but I can’t see why it wouldn’t. Enjoy! I just finished making this, very yummy!! I cooked it for a lot longer, probably an hour and the veges were still nice and firm. The only thing I think I’ll change for next time is less tomato paste and less stout (although I think mine was a dark stout). I’ve never cooked using beer before so didn’t know what to expect. Very pleased to have stumbled across such a great recipes site. Also currently cooking up a pot of the creamy vegan potato soup, very excited to have a taste. I’m an omnivore but I love having vegetarian dishes. Late for St.Paddy’s Day, but honoring my Irish heritage, made this stew for dinner last night. Super simple and came together quickly!! Love that about your recipes, Sam! The color of this stew is incredibly deep and rich. The flavour was amazing! We loved it. In future, I’d probably skip the parsnips, they were good, but not my fave flavour … just a personal taste preference. This stew is just sooooo good. Will keep this recipe handy for sure. Thanks Sam… you make me a good cook! I made the vegan Irish stew tonight. Had to substitute a gluten free beer and couldn’t find astout do I used as dark a gluten free as I could find..OMG..delish! Anna I made the buffalo cauliflower a few nights ago. So good! Cheryl, if you don’t mind my asking, what did you use to substitute for the flour to make this GF? Hi Marissa, the flour in this recipe is just for thickening the stew, so an all-purpose gluten-free flour should work just fine. Enjoy! Very tasty! I cooked it for quite a bit longer than written (maybe 45 minutes in all, but my vegetable chunks were pretty large) and added some Yves veggie beef tenders in the last few minutes of cooking. I worried about the amount of tomato paste but found I needed to use all of it to balance the beer. This is even better the next day, and my carnivore husband really liked it too. Okay, this stew was sooooo good. UGH. I’ve never cooked with beer before and my eyes have now been opened! 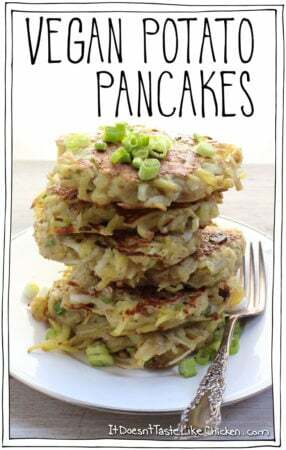 We aren’t big parsnip fans so we substituted cauliflower which was just as yum. Five stars!!! 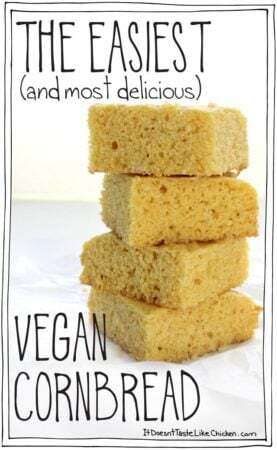 I found this website not because I am vegan (I’m vegetarian) But because I am always looking for creative ways people use fillo as we are a fillo dough manufacturer. I found this recipe last week and decided to try it on St Patty’s day for my family. It was truly amazing. Over 5 stars. We can honestly say that the meat was not missed, and it was full of flavor and texture. Thanks Sam for another great one. Let me know when you come up with a vegan fillo dish, we’d love to feature it on OUR blog. Made this tonight for dinner and it was EPIC!!! This was my first time ever being brave enough to cook with beer and it was better than I could’ve imagined! I added peas and a side of cooked cabbage… just blew my mind! Sam I am continually impressed by your recipes, thank you for keeping things so interesting and delicious! This was the ‘perfect’ Irish stew [veganized]. Thank You! 8noticedd a comment suggesting too much tomato flavor…think I would have to try it with less to notice the difference. Perfectly thick and anything with beer is YUM. Woohoo! So happy you loved it! Awwww that’s lovely! I know just the feeling you are talking about 🙂 So happy you enjoyed it, Johanne! Girl, I can’t stop having bites of these leftovers every time I open the fridge door. Great recipe. Great blog. Oh that’s too bad. You can always reduce it to taste in the future. Great stuff Sam! I ended up using a 16oz can of Oatmeal Cream, Buffalo Sweat stout which made the gravy have a bit of a bite, but still really good. My wife even liked it, which she is still a big meat fan. Couldn’t find any parsnips in the area so I used the multi colored carrots in their place. I’ve never made a stew of any kind before, but it came out great! I tend to be a bit slow in the kitchen, so I was also very surprised that I made it in less than an hour. . Thanks for the great recipes, keepem coming! Beer in a stew? Wowzers! Never would’ve thought of that, but I love how rich and hearty this stew looks and sounds..
Oh thank you for this fabulous recipe Sam. With winter on the way here in Melbourne, Australia, I can’t wait to try this out. Just made this. Really delicious and authentic flavours but for the sake of me being lazy and wanting this to be a one dish meal, I’d have to figure out how to incorporate protein. Would tempeh be tasty in there, you think? 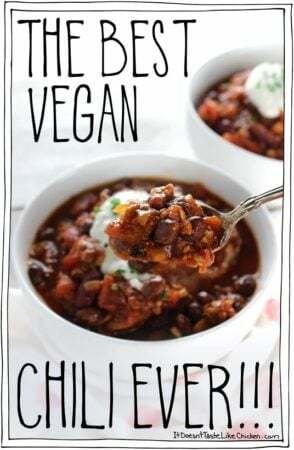 I am addicted to the tofu bits/crumbles recipe that Sam uses in her BEST VEGAN CHILI. I was already trying to justify using them in this recipe – well because the Irish love lamb and all that – but mostly because I love the darn things. Seriously, I think if you want protein, that’s what I would do. All whole plant foods contain protein. So this dish already does contain protein! Woohoo! You can read more about that here. But if you want to add tempeh or tofu, you can totally do that. I would pan fry it first so it doesn’t get mushy in the stew. Enjoy! Sam- tried it tonite with the tofu crumbles. Wow! Both versions are fabulous- you have really outdone yourself with one! BTW – you are so right about protein! Yay! So happy to hear that you loved it so much 🙂 Thanks, Joanne! There is a recipe for Caldo Verde with mushrooms, an “old-world soup” , published recently by Ellie Krieger, a cookbook author, in the Washington Post. In her version she sauteed mushrooms coated in Spanish smoked paprika to add a meaty smokiness in a plant -based way. 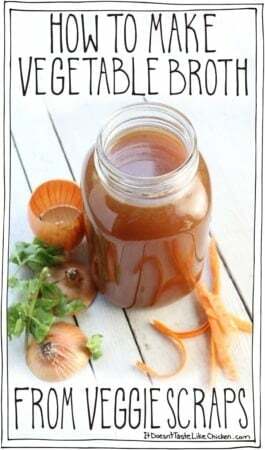 I am looking forward to adapting with vegetable broth in replacing the stout. Making the Vegan Irish Stew for St. Patrick’s Day ! Thanks Sam. MMMMmmmm marvelous! On top o’ the rainbow! Good Gat! Wow, this looks delicious! Just in time for out St Patty’s Day dinner party. Do you think I could finish this off with a vegan puff pastry topper? Thanks! Do you have any suggestions for a replacement for the beer? Deborah, There are any number of dark stouts or porters that will work well. 🙂 Oh, you probably mean that you don’t want to use any beer. Well, you could try some vegan Worcestershire, Tamari sauce, and a little dark Miso. That should provide the umami you get from the beer. 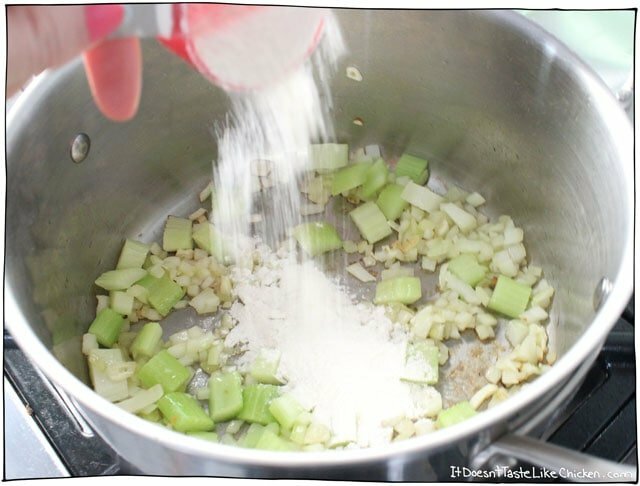 However, you will probably need to reduce or eliminate the 3/4 tsp of salt. I’ve made something similar, sans flour and sugar, for years. Yes, you can replace the beer with a rich broth such as a mushroom broth. You can try amping it up a bit as Cal suggested. Enjoy!